While adding shortcode to page you can define its type – Show categories or Show menu items. View Mode: Grid or List. Categories: Select the needed categories to display them on the live site. Hold the CTRL key to select multiple items. Columns: Specify how many columns will be displayed on the page. Show/hide the following parameters: Category name, Category featured image, Category icon, Category description. View Mode: Grid, List or Simple List. Categories: Select the needed categories to display Menu Items from. Hold the CTRL key to select multiple items. 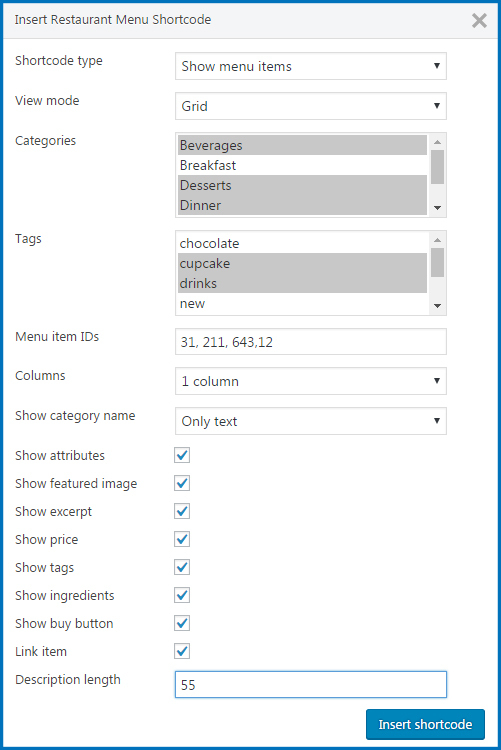 Tags: Select the needed tags to display Menu Items from. Hold the CTRL key to select multiple items. 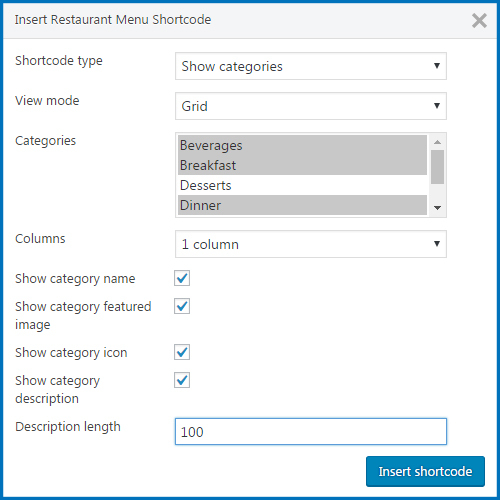 While adding a block you can find Classic editor under Formatting group http://prntscr.com/mxnrf5 Using this type of editor you may find an icon to generate a shortcode for Restaurant Menu. Where i can find a menu item ID’s? You may find ID of menu item in the address bar (URL) while editing certain menu item. So the link will look like this one ..yoursite/wp-admin/post.php?post=597&action=edit So 597 is an ID of menu item. Is it custom page with added shortcode or some archive(system) page? Could you provide page example? Could you also try to add excerpt for menu items . where can we set menu items ID’s ?